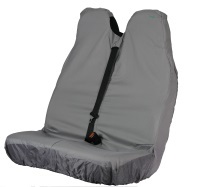 ront universal passenger double stretch seat cover suitable for most vans. 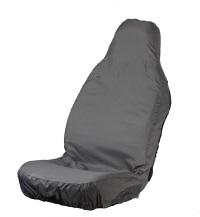 Please note that this universal seat cover will fit a van passenger double front seat only. Perfect for protection in domestic, industrial and agricultural environments and protects upholstery from dirt, grease, oil, water, food, drink and pets. Made from 600 denier Polyester with a waterproof Polyurethane backing. They are heavy duty, tough and hardwearing and will give your seats excellent protection. A single piece cover for double front passenger seat in light commercial vehicles. Do not use with heated seats.